Data Pipeline is typically used in non-GUI applications to move data from one place and/or format to another. However, Data Pipeline can just as easily be plugged into your web, mobile, and desktop applications. Its small size and Java-centric approach makes it perfect for handling your data conversion and data manipulation use-cases. This article will demonstrate how to download CSV (comma-separated values) and Excel data from Java web applications using Data Pipeline. It will also show one way to plug Data Pipeline into your JSPs. The overall design is based on the Model–View–Controller (MVC) architecture. Data Pipeline’s Record and RecordList classes will constitute the model. A single JSP will present the view. A RESTful resource (using JBoss’ RESTEasy framework) will act as the controller. The full source and configuration is included with the download for this blog. The first step is to setup a database and fill it with test data. To save time, we use a HyperSQL, in-memory database with no persistence to disk. The data model is minimal, just a single event table that we create and populate each time the app is loaded. Copy the existing DURATION_MINUTES field to a new field (DURATION), then convert the new field from a number to an interval (as minutes). 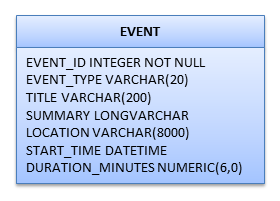 Data Pipeline intervals, like Oracle intervals, hold a quantity of time that can be used in datetime expressions. This demo uses several transformers for clarity, but the add(Transformer...) calls could just have easily been made on a single TransformingReader instance. Next we serve up the first file using getEventsAsCsv(). This method takes the record stream from getEvents() and converts it to a CSV text stream on-the-fly. getEventsAsCsv() can be used to return huge datasets since the CSVWriter is writing records directly to the HTTP response stream without any buffering or batching. The second file is served up using getEventsAsExcel(). This method takes the record stream from getEvents() and converts it to an in-memory Excel document before sending the entire thing to the HTTP response stream. Unlike getEventsAsCsv(), this method has to allocate memory to buffer all of the Excel document’s records. The final step is to present the following data grid and download links for the CSV and Excel files. Since this is an example, we’ll display all records in the table and omit any paging, sorting, or filtering functions. Like the previous methods, getEventsAsHtml() reads the record stream from getEvents(), but in this case collects them into a RecordList. The collected records are then passed onto the JSP for rendering. The JSP renders the 2 download links followed by the data grid. Since the grid is built dynamically, it should handle most tables (as long as there’s data and any HTML in the fields are escaped). Visit http://localhost:8080/events1/ (adjust the port as needed). I need to export data to excel from html (excel content type) which has more than 90k rows. this leads to memory and server crash issue. Pingback: Export CSV and Excel from Java web apps With Data Pipeline | Dinesh Ram Kali.